I first had the pleasure of seeing Andrea Scott’s Better Angels: A Parable in an early production at the 2014 New Ideas Festival, so I was excited to see how the piece had evolved for the SummerWorks production, directed by Nigel Shawn Williams and currently running at the Theatre Passe Muraille (TPM) Backspace. 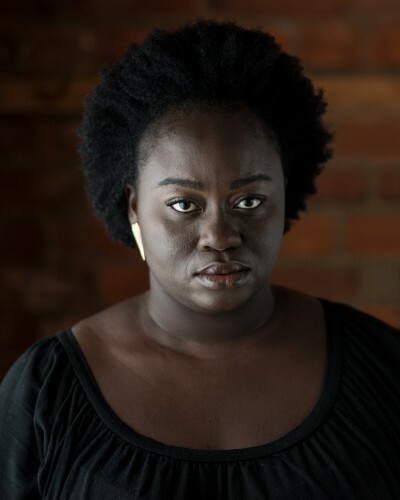 Akosua Mansa (Akosua Amo-Adem) is a young woman from Ghana who moves to Toronto to work as a nanny/maid in the home of Leila (Sascha Cole) and Greg Tate (Peyson Rock). Wide-eyed with excitement over her new job, the prospect of living in a new place and her first plane ride, Akosua welcomes this change and adventure in her life. Leila and Greg are friendly and welcoming – with Leila fastidiously in charge of the household; she’s left her corporate job to work on a novel, and the house must run like clockwork. Greg is low maintenance by comparison, if not a bit clueless about the household routine, and often working after hours – and we come learn that he has other things occupying his mind. Soon, though, Akosua finds things are not so easy-going in the Tate house, as she finds herself working without pay for several months, then having to choose between getting paid and going home for a visit during the Christmas holiday (which, as a Muslim, she doesn’t celebrate). And Leila successfully manages to manipulate day-to-day activities so Akosua has no unaccompanied access to the outside world – and she’s taken possession of Akosua’s passport. Rather than wallow in her misfortune, Akosua uses her intellect and power of observation to turn her situation around. Williams and Scott (who both also provide voice-overs for the play) have assembled an outstanding cast for this production. Amo-Adem is a delight as Akosua, giving us a young woman embarking on a great adventure who is animated and excited, yet solidly possessing of strength and resolve. This exuberant young woman is no push-over; she may be new to her position and to Canada, but she is nobody’s fool, and unapologetically asserts her rights when she finds herself being cheated of freedom and wages. Cole does a lovely job with Leila’s complex layers; tightly wound and controlling, and extremely entitled, but desperately lonely – and with a jealous streak. She does a remarkable job with the backhand compliments and ethno-cultural faux pas, which serve to highlight that, while Leila is interested in – and even attracted to (Greg is half black) – the black community and culture, she views it as “other” and sees black people as stereotypical “exotic” creatures, and has little to no respect for, or understanding of, their history and lived experience. Rock does an amazing job conveying the multifaceted aspects of Greg; he is largely absent from his marriage and has a laissez faire attitude towards the household – his interest in the goings-on in his home only piqued when he feels his position is threatened. Beneath the affable, good-natured, hard-working husband exterior is a man squirming with inner conflict and secret passions. Better Angels: A Parable is nicely bookended, with Akosua’s personal anecdote at the top of the play about a getting a childhood lesson in the unfairness of the world, and her closing piece of storytelling about the West African spider god Anansi turning the tables on Death. With shouts to the set (Laura Gardner, who also designed costumes) and lighting (Jennifer Lennon) designers for the beautiful and evocative spider theme used in this production. The yellow fabric placed web-like floor to ceiling and along the floor, and the lighting effect on the wall of Akosua’s tiny attic room – all in all, highly effective and imaginative design and staging for this production, especially on so small a playing space. Better Angels: A Parable is a compelling morality tale of modern-day slavery and a young woman’s action to regain her freedom. Better Angels: A Parable continues at the TPM Backspace until Aug 16 – check here for exact dates and times. Advance booking or early arrival at the box office strongly recommended – they had a full house at yesterday’s performance.